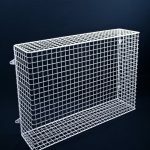 MS Guardio offers a number of radiator guard options that are available via our bespoke service, which provide additional health & safety features or enhance the guards for particular needs and environments. From left: (1) SH24 storage heater guard with support bar and lockable control flap (2) bespoke storage heater guard with sloping top, control flap and skirting cut-outs. To access a control panel on the heater, it is recommended that you buy a guard with a control flap. Aiano control flaps are securely fixed to the guard on welded hinges and lie flush with the surface of guard. The flap can be secured shut with a small padlock if you want to prevent access to the controls by non-authorised persons or children. A control access flap is much safer option than having an opening in the guard, through which children and adults may still touch the heater. If you want a control flap on your guard, it is essential to check the size and location of the controls on your heater. In some environments, a radiator guard can appear as a tempting seat or shelf on which to place objects – a coat, books, a cup of coffee…. This can be dangerous and can interfere with the safe functioning of the guard. Objects placed on top of the guard can interfere with the heat circulation and cause the guard to get hot. 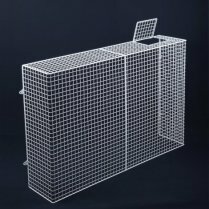 Sloping tops radiator guards prevent people sitting on or placing objects on the guard and are particularly useful in Schools and Libraries, to avoid compromising the function of the guard and prevent damage to books. Skirting cut-outs can be made to any size to ensure the heater guard fits snugly to the wall. 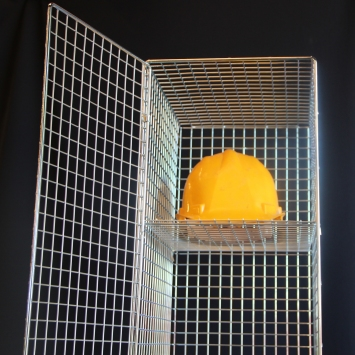 From left: (1) Panel heater guard made from half by half inch mesh, with support bar and lockable control flap (2) heavy duty storage heater guard made from angle bar, flat bar and 1” x 1” mesh with control flap. 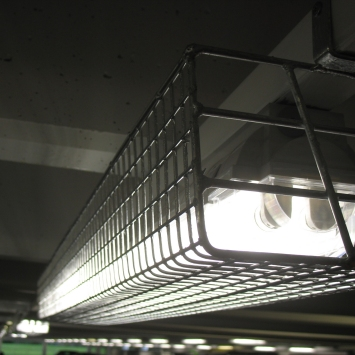 When the radiator guard will be used in an environment where the guard must be removed for some of the time to provide access to the heater, to facilitate cleaning or for some other reason, the guard can be fitted with welded hooks instead of welded lugs. Instead of screwing the guard to the wall, the guard can be lifted on and off of screw-eyes fixed to the wall. Welded feet or legs can be added to the bottom of storage heater guards to facilitate cleaning inside the guard. Sometimes additional cut-outs are needed to allow the guard to fit over pipes and obstructions, such as sockets or valves. If you need to access the heater controls but do not wish to have a control flap, control sticks can be supplied for adjusting the controls on Dimplex storage heaters or other heaters with similar controls. 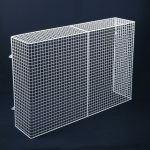 If you need to ensure that fingers or other objects cannot be passed through the mesh radiator guards can be made with from mesh with a smaller aperture, typically 12 x 12mm ( ½” x ½” x 16swg). 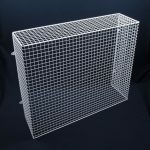 Heavy duty radiator guards are made from a combination of steel angle bar, flat bar and 25 x 25mm 12swg weld mesh. 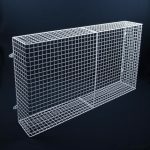 If you would to request, discuss or receive a quotation for any of these radiator guard options for health & safety please contact us via our bespoke services with a brief description of your requirements and someone will contact you.